LONDON, England (CNN) -- London is a city used to playing host to the festival of football matches, home to five clubs in the English Premier League alone, not to mention a myriad of smaller clubs from lower divisions, it seems the next game is just around the corner; sometimes literally. But even for this soccer-saturated town, the last seven days were a bit special with the hosting of not one, but two Champions League semifinals. 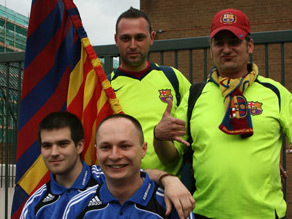 Fans from around the world descended on London this week for the second-leg Champions League semifinals. Two of the capital's biggest clubs, namely Arsenal and Chelsea, would play host to the second and decisive installments of their gladiatorial, last-four fight-outs with holders Manchester United and Spanish hot-shots Barcelona respectively. The final to decide the 2009 winner of the biggest prize in European football will be held in Rome and both sides had good reason to dream of a trip to the Eternal City come the end of May; for Chelsea, a chance to avenge last year's cruel final defeat on penalties, for Arsenal, an opportunity to prove growing critics wrong that Wenger's side is lacking the necessary steel of previous silverware-winning sides. First up, Manchester United's visit to Arsenal, an occasion that saw the north London streets of Islington (the district of Arsenal's home stadium) burst into life with banners, banter and beer-fueled optimism despite the need to overturn a 1-0 deficit from the first-leg. Sadly for the Gunners, Alex Ferguson's team gave a performance of such vintage quality that dreams were soon replaced with disbelieve before gallows humor, in turn, followed. Chelsea debate: Bad decisions or bad losers? Rare in any sport is it that a team applaud their arch-rivals from the pitch, but even the disappointment of falling one hurdle short of the final could not blind those in attendance to the brilliance of the display. Arsenal fans duly clapped their conquerors from the theater of conflict. Could London's other candidate be counted on to stay the pace? Barely 24-hours on, this time it was the turn of the King's Road of west London to complete a metamorphosis into a sea of fans as the faithful from both sides walked towards the Stamford Bridge stadium-home of Chelsea. Blue colors for the home side and Barcelona reds and yellows decorated the backdrop of another dramatic night of football in London. Michael Essien's thunderbolt of a volley reminded everybody why the Ghana midfielder is so highly rated but the drama of the evening came less from the quality of football and more from controversial refereeing decisions and the late twist from Andres Iniesta. Having had a man sent off and with only seconds remaining of the game the Spaniard fired his team through with a vital away goal to seal an improbable victory. Chelsea fans were left disgruntled and depressed as their chance of retribution was snatched from them so cruelly. There would be no applause for their opponents, only Didier Drogba venting his spleen at the perceived injustice of the result at the hands of referee. And so the European football circus moved on from London for another season, leaving the city's clubs licking their wounds, but as is often the case with a hangover the it is the joy of the party that will stay in the memory.